A precursor to this meeting series could be considered the "Conference on The Biology of Neuroblastoma" which was jointly sponsored by Children's Orthopedic Hospital of Seattle and Children's Hospital of Philadelphia, held September 15-16, 1967 and chaired by Alexander Bill, MD and C. Everett Koop, MD, ScD. 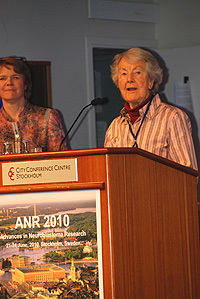 The Advances in Neuroblastoma Research began formally as a series of symposia held at Children's Hospital of Philadelphia on May 30, 1975, chaired by Dr. Audrey Evans. Subsequent meetings were held in 1979, 1984, 1987, 1990, and 1993. These meetings became increasingly international in their scope. The European neuroblastoma community began to also have meetings, in 1991 and 1994 in Heidelberg. The 1994 meeting involved a small number of investigators from the USA, leading to a decision to hold the meetings every two years, with the venue changing each time and alternating between Europe, Asia/Australia and the USA.